The newest four-legged Hillsboro police officer tracked and located a suspect in Forest Grove on Monday. Last month, the Hillsboro Police Department's newest police dog completed his training and certification. This week, K-9 Rocket marked his first major milestone in his police career. 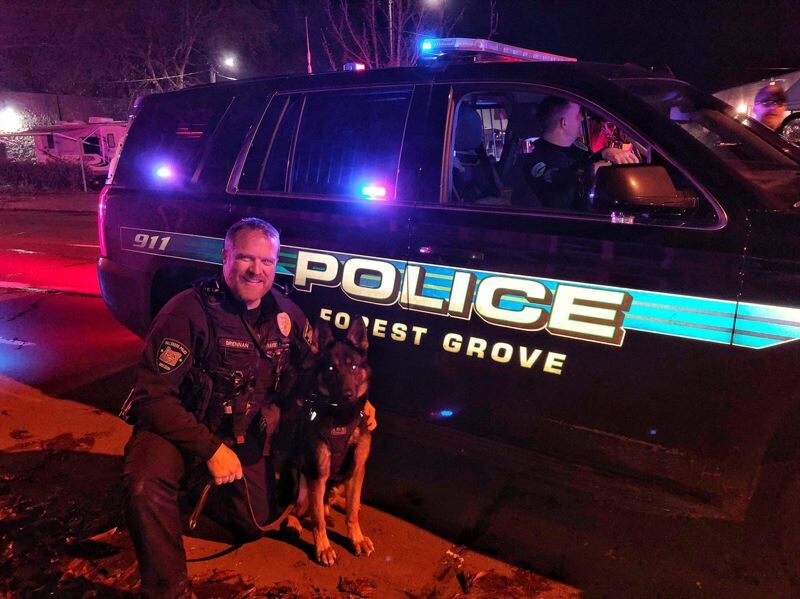 On Monday night, Dec. 3, Rocket and his human partner, Officer Scott Brennan, responded to a mutual aid request in Forest Grove for a tracking dog unit. Rocket was able to successfully track, locate and capture a suspect — his first such live search since being certified Nov. 19. "Rocket came onto the force over the summer, and he just finished the K-9 academy and got certified," said Sgt. Eric Bunday, a Hillsboro police spokesman. Rocket was purchased with the support of the Hillsboro Elks, which donated $10,000 toward the purchase of a new police dog in 2017. The purebred German shepherd, who was born in the Netherlands, joined the Hillsboro Police Department on July 13, Bunday said. "Once we get the dog, he officially joins the force, but he's not able to be used in a live setting until he's certified," Bunday explained. "When he was certified, then we were actually able to use him for dog tracks, evidence searches, that sort of thing." The Forest Grove Police Department does not have a police dog of its own. However, under the principle of mutual aid, in Washington County, K-9 units are frequently sent out on calls outside their own agency's coverage area. The Washington County Sheriff's Office and the police forces of several local cities — including Hillsboro, Beaverton, Lake Oswego, Tigard, Tualatin and Sherwood — have K-9 divisions, with some dogs specialized for narcotics detection but most trained for tracking. Forest Grove Police Capt. Michael Hall said Forest Grove police will call for support from another law enforcement agency when they needs a tracking dog. In this case, he said, Hillsboro's Brennan and K-9 Rocket were able to respond the quickest. The case that brought the Hillsboro tracking team to Forest Grove was "not real unusual," Hall said. A suspect allegedly leapt from the balcony of a residence when Forest Grove police officers arrived to arrest him for an outstanding warrant, fleeing the scene. K-9 Rocket was able to track the wanted man from the 2800 block of Pacific Avenue for his first successful capture. "Kind of a big deal for the pooch," Hall said with a laugh. The Hillsboro Police Department has five dogs in all, with Rocket being the newest member of the K-9 division. Brennan, Rocket's human partner, is an experienced K-9 handler who spent five years paired with K-9 Rikko, who retired from the Hillsboro police force in 2015. He has been with the Hillsboro Police Department since 2006.